You know how sometimes you find yourself thinking how come it’s autumn again already? That feeling of where did the time go and how did I not see the summer go by? As a recruiter, it’s a bit like that when you find yourself – once again – faced with the challenge of having to fill a position. A long, costly and often painful process. Although the exact numbers may differ based on the type of job, experience, and industry, research shows that it costs businesses on average between 6 and 9 months of salary to replace an employee. And that is just the financial side of things. Because when one of your (long-term) employees leaves the company, the real cost involves much more than just money. There is the loss of experience, the impact of the employee’s departure on her/his colleagues and their morale – especially if they were much appreciated by their co-workers – and, if they were directly involved with your clients, there may be the potential loss of clients to deal with as well. In other words: the pressure to find a killer replacement is on. As always, time is of the essence and you need to recruit someone sooner rather than later. The last thing you need right now is an inefficient hiring process. This brings us to today’s topic – one of the ways to streamline your recruitment process, decrease time-to-hire, and cost-per-hire: full cycle recruiting. Full cycle recruiting – what’s in a name – is a recruitment method whereby one recruiter (a full cycle recruiter indeed) is involved in, and able to complete, every step of the process. Great, we hear you think, but what does this really mean? Full cycle recruiting involves everything from start to finish. From creating the job advert and getting it out there via the appropriate channels to preselecting and eventually preparing the candidates for their first day in the office. Of course, full cycle recruitment doesn’t always have to be the most efficient way of working for every organization out there. However, especially in small and medium-sized companies, where the roles of HR professionals and recruiters are usually not fully specialized, this recruitment approach works best. This doesn’t mean that recruiters from larger companies can’t benefit from this recruitment method though, but it has to fit in the specific team size and structure. • Being tech savvy. Especially when you’re taking care of every step of the recruitment process, you’ll need to use technology and tools to automate parts of the process. Having some (basic) technology skills definitely makes your life easier. Think of social media skills, knowing how to work with an Applicant Tracking System (ATS), pre-employment assessment tools, etc. A question arises: How can you make sure you make the most out of this recruitment method? What are some of the key elements to take into account? We’ve listed 9 ways to benefit from full cycle recruiting below. Yes, this one may seem obvious. But it’s also crucial that you get this right – and straight from the onset. Make sure you know exactly what kind of profile the hiring manager is looking for and by that, we don’t just mean someone’s educational or professional background. Dig a little deeper, what kind of skills and personality traits are important for the job? What’s the rest of the team like, is there a certain profile that would complement the others? And what about the company culture? See if you can find out more about that too. The more information you have, the better equipped you’ll be to find the right person for the job. This one is along the same lines as the previous tip we gave. Put yourself in the shoes of the hiring manager, think like she or he would. It’s not simply about who’s the best person for the job. More broadly, it’s about who’s the best person for the team – and the organization – as well. Use the information the hiring manager has given you to help them define the ideal candidate. After all, two heads are better than one! • Personality traits (in a customer facing role, for example, you’ll be looking for someone who’s very customer-minded, patient and friendly by nature). Once all the preparation is done, it’s time to get that job advert out there. A quick word perhaps first about that job ad. The way a job advert is written determines whether or not the people you’re targeting will respond. You may not be aware of it, but the way you phrase certain things and the type of words you use in a job advert provokes a reaction among potential candidates. This is one of the reasons why some companies find they always get a lot more reactions from male candidates on their job postings than from female candidates. The good news is, there are some very nifty tools on the market that can help you with this. One of the popular applications is Textio, an augmented writing platform that helps companies write impactful, gender-neutral job descriptions. When you’ve nailed that job advert and made sure that it will appeal to a diverse group of candidates, it’s about targeting them via the right channels. This means you need to know where your applicants hang out, online that is. Depending on whether your hiring Generation Z employees, Millennials or Baby Boomers, their virtual whereabouts may differ. The former are likely to spend a lot of time on SnapChat and Instagram while the latter may prefer LinkedIn for instance. If you don’t have the time to do the necessary preliminary research and the subsequent targeting via various channels, you may want to use a programmatic advertising tool. The technology in a nutshell: programmatic advertising is the automated placement of job ads – targeting the exact profiles a recruiter is looking for and – better yet – right where your candidates are. As such, a pre-employment assessment tool helps you make hiring decisions based on facts rather than gut feeling. It also automates a (big) part of the recruitment process because the software lists all the candidates that went through the assessment, starting with those who’ve got the best matching score. When you’ve got your shortlist, it’s time to meet the remaining candidates in person. We all know how difficult it can be to schedule a meeting with just one person – finding a day and a time that works, confirming the appointment, etc. Let alone if you have to schedule a dozen interviews with a dozen different people. It’s almost impossible to keep on top of this without some support. A virtual assistant – also known as a chatbot – can take care of tedious tasks such as interview scheduling. It can answer candidate questions about the recruitment process and send them updates about their status and the next steps too. In other words: a chatbot can save you heaps of time and hassle. When it comes to the actual interview, it’s good to stick to a certain structure. Prepare a set of questions together with the hiring manager and ask every candidate the same questions in the same order – this is to avoid bias as much as possible. Depending on the role you’re interviewing people for, you may want to ask your applicants to complete an assignment beforehand. If for example, you’re looking for a creative writer, you can ask them to write a 2000-word essay on a particular topic. This is another way to avoid bias and treat everyone equally. Something else you may want to think of during the interview is asking candidates what’s important to them in their workplace. Do they attach great importance to a pleasant work-life balance? Do they want to develop themselves personally and/or professionally? It’s good to know these things because if you’re going to extend an offer to them and you can’t pay them as much as they’d like, you’ll need to seduce them in other ways. We’ve said this so many times, it could be one of our mantras. Feedback is super important. Full cycle recruiting is no exception – or excuse – to eliminate candidate feedback. Even when an applicant did make the cut, or perhaps especially when they didn’t, it’s very useful for them to know what went well and what didn’t. Constructive feedback gives them something to work with so they can improve for the next time they have an interview somewhere. An added benefit of giving your candidates valuable feedback is that it positively impacts their candidate experience. From our own experience here at Harver, we know that the vast majority of (rejected) applicants still rated their overall experience as positive – mostly because of the personalized feedback report they get at the end of the online assessment. A happy candidate – even a rejected one – will talk positively about your company to their friends and family and most probably continue to use your products and/or services. It wouldn’t be full cycle recruitment if there wasn’t a job offer to be extended to a candidate at the end, would it? In terms of the offer, there are various factors to take into consideration. Of course, there is the salary. Yes, ideally the salary you offer is at least equal to the one your competitors pay for a similar role. In a perfect world, you beat whatever it is they pay. In the real world, however, you may not even be in a position to pay the same. If the latter is the case, you need to get creative. 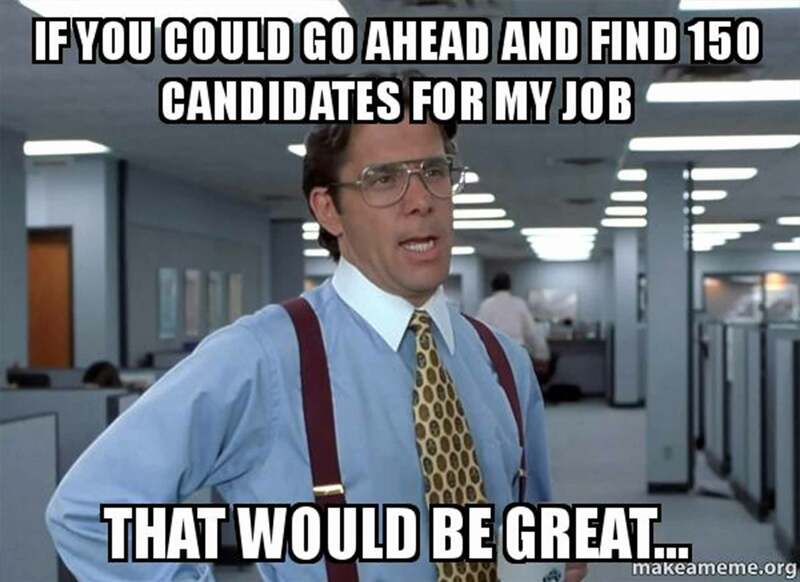 What can you offer your candidate? Think of the possibility to work from home, unlimited holidays, health and wellness benefits, a great learning and development program, free lunches, etc. Use all kinds of non-monetary benefits to create the perfect package for your candidate. This could be another one of our mantras. Too many companies still put a lot of time and effort in recruiting that ideal candidate only to forget about the pre-boarding and onboarding phases. This is such a shame and a missed opportunity. There are numerous surveys and various percentages, but many new hires leave somewhere between the first week and the third month of their new job, often because of a non-existing or disappointing onboarding process. Don’t have a gap between your recruitment process and your onboarding. This is the period that’s referred to as ‘pre-boarding’ and it starts pretty much as soon as your candidate has signed her or his contract. Create a memorable first day. Think of ways to make navigating through the tedious company documents and systems more fun – use bite-sized nuggets of information for instance. Check in with your new hires after a couple of weeks and then after a few months; in case there is an issue, you can be on top of it right away. As a recruiter in a small or midsize business, you need to spend your time wisely and optimize the process wherever you can. Adopting a full cycle recruiting approach, perhaps with the guidance of the above-mentioned tips, can help decrease not only your time-to-hire but also cost-per-hire, as well as make your overall recruitment process more efficient.